A report from Clammr collected data on podcast listening habits shows that iOS dominates Android on mobile usage. Despite Android having a larger install base of smartphone devices than iOS, the iPhone is responsible for the vast majority of podcast listening. According to the study, 82% of smartphone podcasting listening takes place on an iPhone with the iTunes Store podcast directory being a significant reason for uptake. In addition, despite the vast array of third-party podcast apps available for the iPhone, the report says that over three-quarters of users listen to podcasts on the iPhone with Apple’s built-in native Podcasts app. 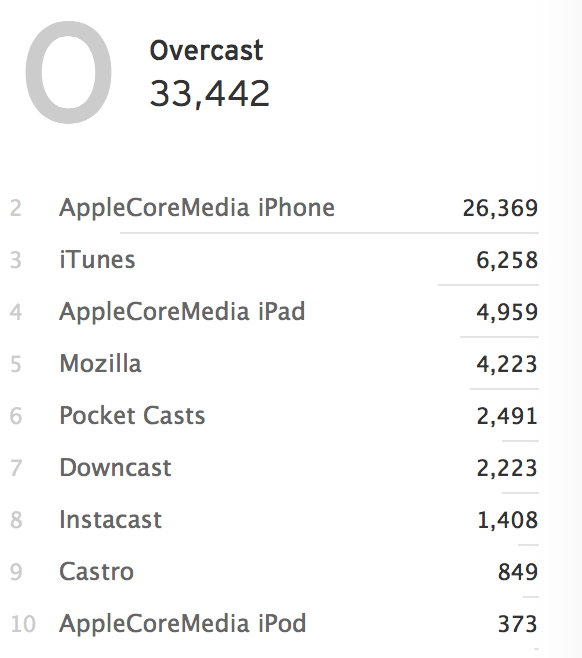 According to the analytics I get from SoundCloud, Overcast has a slight edge over Apple’s Podcasts app among listeners of The Talk Show. But it’s no surprise that listeners of my show aren’t exactly typical users. No other iPhone app even comes close to Overcast and Podcasts, though. Here’s a screenshot of the top ten clients by “play count” for episode 125, with Horace Dediu. What’s funny is that the name “podcasts” stuck but very few people use iPods to listen to them any more.